The Academic Instructional Center (AIC) represents the University’s latest innovative endeavor to create a balance between the natural and built environment. This LEED Certified facility takes advantage of passive solar techniques both in the building siting and its extensive natural ventilation system. The innovative new Academic Instructional Center (AIC) at Western Washington University provides the campus with 750 classroom seats and a new home for the Psychology and the Communication Sciences & Disorders Departments. Among the sustainable attributes helping it to achieve LEED Certification from the U.S. Green Building Council is an extensive natural ventilation system to draw fresh air indoors and expansive daylighting throughout the building, reducing the building’s need for conventional lighting and heating. The AIC responds to the scale of the new Communications Facility to the north, and defines the southeast edge of a new campus quad. 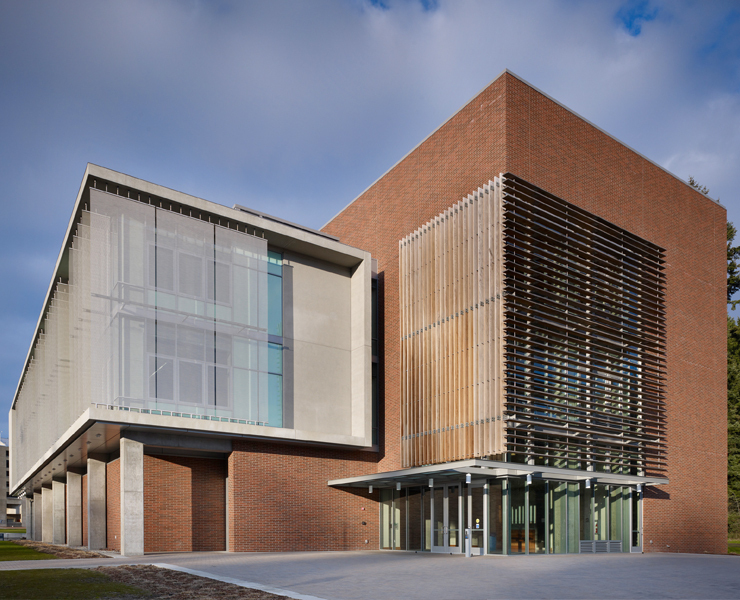 The building was designed to remain low in scale and maximize sun exposure for passive thermal heating. A number of site and land use features contribute to making the AIC a more environmentally sensitive facility. The building is positioned to take advantage of public transportation. Seven bus lines service a public transit stop located 0.1 mile from the building’s entrance.